The second coming of Jesus Christ has been a biblical theme that has greatly edified the lives of believers throughout the many centuries of the Church's history. It has also given rise to many strange and speculative teachings - often controversial, sometimes heretical. It is unfortunate that this great biblical teaching, so full of comfort and hope, should so often be maligned and used by certain teachers to gain a following. As one of the greatest expository preachers of all time, Charles Spurgeon abhorred much of the speculative teachings of this day and the many attempts to form a consistent scheme of biblical prophecy as to the future. Rather, he looked for those aspects of the second coming of Jesus Christ that he knew would have practical impact upon the lives of his listeners. Those became the basis for his passionate biblical message. 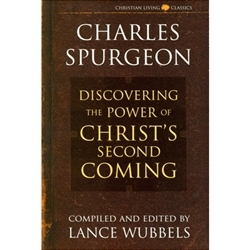 Come with Charles Spurgeon and consider the imminent return of Jesus Christ, the first resurrection, the judgment of the world, the believer's citizenship in heaven and what it will mean to be forever with Christ. Discover the wonder of what will happen to believers when they see Christ and behold a vision of the latter-day glories for the Church. Timeless messages on living passionately for Jesus Christ await you.